It really went fast. Only seven months after siging the contract, Bombardier was able to outshop the first Traxx DC for Koleje Mazowieckie from Poland. In the last days of 2010, the first unit was transported from Vado Ligure, Italy, to Poland. At the test tracks of Węglewo, Poland, the first trials were made with the new and colourful locomotives, temporary designated as E583.001 to 011. In August KM started first trials in revenue services, with its 37 Bombardier-built double deck coaches. On 29.08.2011, Bombardier officially handed over all eleven units to KM. Since then they are known as EU47 series, or 5170 series when you prefer digits. The final hand-over of all eleven units is scheduled for 29.08.2011. Finally, it is final. No Chinese locomotives in Poland (yet). Today, Bombardier officially publishes that is has been awarded with a 41 million order for eleven new electrics by Polish operator Koleje Mazowieckie (KM). 2010-02-13 [PL] Koleje Mazowieckie: Bombardier to beat the Chinese? [PL] Koleje Mazowieckie: Bombardier to beat the Chinese? The Polish website Railway Market reports on the proceedings of the tender for 11 modern electrics of Polish operator Koleje Mazowieckie. Appearantly Bombardier has made the best offer now. That's remarkable because one month ago various media stated that Chinese manufacturer Zhuzhou Electric Locomotive Co. had done the lowest bid. The Chinese supplying modern electrics to Poland, that would have been an interesting new development; It is a sign, in the near future China will gain importance as supplier of modern rolling stock, around the world, that's for sure. 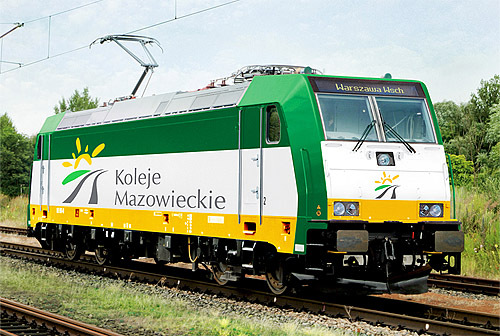 For now it seems that Koleje Mazowieckie will choose for the proven European Traxx platform of Bombardier. They would be a solid combination with the new double deck coaches, also built by the Canadian manufacturer. On 21.04.2010, Bombardier was awarded with a 41 million order for eleven new electrics by Polish operator Koleje Mazowieckie (KM). Until the end, also a Chinese manufacturer was in the running for building these machines, but finally the German-Canadians won. For the first time, Traxx DC units (P160DC) will be specifically built for passenger services, meaning that they will have a top speed of 160 kph and will have all neccessary equipment on board for push-pull services with the Bombardier double-deck rakes, already operated by KM. On 28-29.12.2010, the first KM unit was transported from Vado Ligure in Italy to Poland, via Germany. Its designation is E583.001. Bombardier 8367 2010 TRAXX P160 DC Bo'Bo'-el KM "5 170 001-9"
Bombardier 8368 2010 TRAXX P160 DC Bo'Bo'-el KM "5 170 002-7"
Bombardier 8369 2011 TRAXX P160 DC Bo'Bo'-el KM "5 170 003-5"
Bombardier 8370 2011 TRAXX P160 DC Bo'Bo'-el KM "5 170 004-3"
Bombardier 8371 2011 TRAXX P160 DC Bo'Bo'-el KM "5 170 005-0"
Bombardier 8372 2011 TRAXX P160 DC Bo'Bo'-el KM "5 170 006-8"
Bombardier 8373 2011 TRAXX P160 DC Bo'Bo'-el KM "5 170 007-6"
Bombardier 8374 2011 TRAXX P160 DC Bo'Bo'-el KM "5 170 008-4"
Bombardier 8375 2011 TRAXX P160 DC Bo'Bo'-el KM "5 170 009-2"
Bombardier 8376 2011 TRAXX P160 DC Bo'Bo'-el KM "5 170 010-0"
Bombardier 8377 2011 TRAXX P160 DC Bo'Bo'-el KM "5 170 011-8"